OF TOKYO - ON A BIKE! 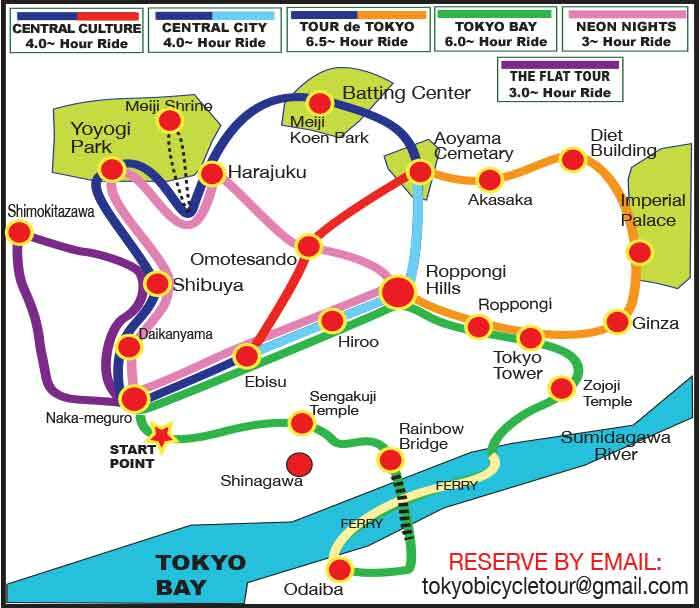 You will love doing a bike tour in Tokyo! Choose from the five different guided rides above for a great look at Japan's capital city! The bike tours are mix of both new and old - so you'll see back streets, city centers, parks, rivers, cemeterys and more! The rides are a great way to catch a lot of the main tourist sites in Tokyo in a compact amount of time - much more fun than traveling around on crowded trains or subways! Whether you are a family, a group or just solo, joining a bicycle tour is a great experience. All the rides are in English and provide for excellent photo opportunities along the way! For families there are 3-4 children bikes suitable for kids 9 years old and above, and 2 bikes with child seats (ask for details). Click 'Reservations' tab above for info about signing up! April 22nd - CITY 4 hour Ride - 1 spot open! April 27th - 4 hour CULTURE Ride - 2 spots open! MAY 1st - Ride Available! MAY 2nd - Ride Available! MAY 3rd - Ride Available! MAY 4th - Ride Available! MAY 6th - Ride Available! MAY 7th - Ride Available! MAY 8th - Ride Available! MAY 9th - Ride Available! MAY 10th - Ride Available! MAY 11th - CULTURE 4 hour ride - 2 spots open! MAY 13th - CULTURE 4 hour ride - 4 spots open! OTHER and FUTURE DATES BY REQUEST!